Ask Dan! about DSS - How can managers create a successful digital transformation? How can managers create a successful digital transformation? Digital transformation is a complex concept and challenging goal that holds a variety of meanings for a diverse set of stakeholders. In a recent Forbes article, Kerschberg (2017) contends that technology is central to organizational digital transformation, in particular adopting analytics, big data, mobile, cloud, IoT, and application development. While technology may be at the core of digital transformation, successful digital transformation requires excellent leadership, a supportive culture, and new business processes. Leadership should promote and cultivate a data-based culture. Digital transformation remains a complex task that begins with strategic leadership and a digital organization strategy. A related discussion on digital transformation, cf., Power (2017), stated that a strategic vision for digital transformation is useful, however vision must be grounded in customer needs and technology possibilities. Indeed, business transformation cannot happen without people making decisions about technology. With this view in mind, Figure 1 is a conceptual decision support guide for managers interested in digital transformation. 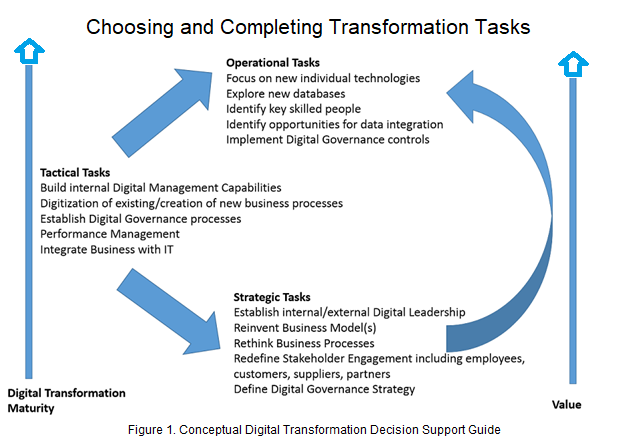 The conceptual model highlights three levels of organizational tasks for digital transformation including: 1) strategic tasks, 2) tactical tasks and 3) operational tasks. The levels are characterized by a set of tasks that should be completed as part of an organization’s approach to digital transformation. Through the selection of some or all of these tasks, organizations can move from an ad-hoc approach to a more systematic approach to digital transformation. Achieving digital transformation that is stable and "mature" comes from successfully completing transformation tasks. According to Westerman et al. (2012), digital transformation maturity may be characterized by 1) the level of investment in technology and 2) the level of investment in leadership to enable digital transformation. In their article, Westerman et al. indicate that increased digital transformation maturity results in increased value. Value is typically measured in terms of improved financial performance of the organization. The transformation tasks may be broadly characterized in terms of people, processes and technology. For any business strategy to be successful activities across these levels need to be aligned. In their Harvard Business Review article, Trevor and Varcoe (2017) promote the notion of strategies, capabilities and resources to achieve digital transformation including systems that “should be arranged to support the enterprise’s purpose”. Strategic tasks represent a high level collection of activities that implement a digital transformation strategy. This list of task includes developing digital leadership capability (Westerman et al., 2017), reinventing business models, rethinking business processes, redefining stakeholder engagement (Kerschberg, 2017) and developing a digital governance strategy (Ernst and Young, 2017). While this list is not exhaustive, it is moving towards a more balanced and holistic approach for managers to tackle digital transformation in their organizations. As illustrated by the “middle out” notation used in Figure 1, tactical tasks are integral to the success of a digital transformation strategy. Trevor and Varcoe (2017) refer to this mediating managerial level in terms of building organizational capabilities. At this level, it is important for managers to consider and select tasks that provides them with the means (capability) to deliver on the digital transformation strategy. These tactical tasks will drive the digital transformation agenda in an organization with managers asking questions around how transformation can be achieved based on the capabilities available. Tactical tasks are concerned with designing new business processes, establishing disruptive new business models and defining data governance processes. It is also useful to consider new mechanisms for evaluating performance in terms of achieving digital transformation. This may be an opportunity for managers to define new measures of organizational success including understanding customer engagement and customer experience. Operational tasks are focused around the questions managers will need to answer for 1) selecting and developing technologies, 2) establishing viable data integration platforms, 3) choosing necessary security controls that will balance data access with data protection, and 4) identifying and developing the right people capabilities to achieve the digital vision for the organization. Managers need to select and complete tasks that allow them to develop “assets that will be useful in a digitally transformed world” (cf., Capgemini Consulting, 2011). Completing the appropriate mix of tasks should increase digital maturity and create a stable digital transformation. Technological maturity is at the heart of achieving real digital transformation maturity. To begin a digital transformation journey, managers need to move beyond focusing on new individual technologies to develop a comprehensive digital technology capability that is closely aligned to a well defined digital transformation strategy. Digital transformation can both solve problems and create new problems. Successful digital transformation creates a positive, long-term, net benefit for an organization. Applying digital technologies can create a data-based virtuous feedback cycle that leads to adopting more innovative and transformative digital solutions.